Offering this exquisite tall candlestick with ornate raised floral scrolls which compliments the sleek elegance of the smooth areas. Large round weighted base for nice balance. Comes with separate ornate bobeche and a separate snuffer cap that has a beautiful floral finial. 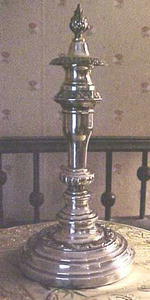 Candlestick complete measures 11 3/4 inches tall; 5 1/4 inch diameter base. Good+++ condition, no silver loss, three teeny dings on base edge. Hallmarks on side of base rim are three shields with a C S C on them - possibly this is Sheffield? Believed to be silverplated versus sterling silver. Green felt on bottom to protect furniture. The quality of workmanship and design style of this candlestick will bring elegance to any decor - any room!